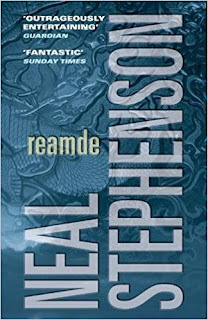 Like most people who have worked a lot with computers, I immediately saw the title of Neal Stephenson's book Reamde as a variant on 'Readme' - as indeed it is. 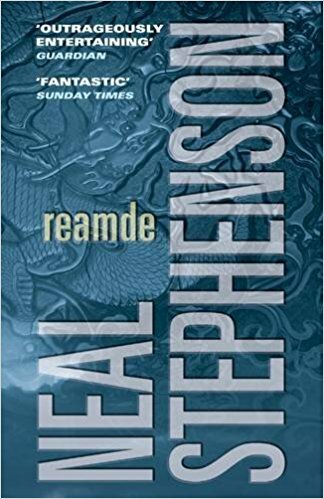 I've really enjoyed his science fiction work like Cryptonomicon and Anathem before, and have even managed to overcome my loathing of extremely long books, as in these works Stephenson is not indulging in drivel, but really fills them with content. However, Reamde has left me with very mixed feelings. I loved the plot segment that the book's title refers to. Reamde is a virus that takes computers hostage, linked to a massive multiplayer online game called T'rain, which was created as a way of using the virtual coinage inside the game for far more than simply buying a new sword. If you are interested in computer gaming, the parts of the story that revolve around the game are brilliant - as is the twist of the virus resulting in an organised crime gang trying to track down its creator. However, this only accounts for around 1/4 of the 1,000 plus pages, and I was far less happy with the rest. Firstly, while the multiplayer game storyline is borderline SF, the rest is just a straightforward action thriller with good guys versus evil jihadists. This mostly consists of two huge set piece battle sections, each lasting several hundred pages. I'm not particularly interested in this kind of storyline, which despite being page turning in its intensity at the peaks had a lot of dull troughs. It didn't help that where previously Stephenson's expansive writing was a result of having lots of content, in the battles it really did feel like there was far too much padding and I found myself skipping whole pages at a time to get to something happening. I'm afraid he has strayed into late J. K. Rowling-itis - too famous now for an editor to dare to suggest cutting out the woffle. Two more issues. Stephenson uses a large numbers of points of view, which I find tedious - while the T'rain part of the story was running I wanted to switch back to the main character's view, and got irritated with all the switches away, while in the battle scenes, and pretty much the last half of the book, the main character hardly features at all and is just a minor character of many - this isn't my favourite style of writing. The final problem probably reflects my being British. The good guys are pretty well all rabid gun enthusiasts, which plays a major part in the storyline. I'm afraid this just leaves me cold - it was, at times, as if two lots of terrorists were fighting each other. I appreciate that this may have been in part to reflect the nature of battle in an adventure game, drawing real world parallels, which was decidedly clever, but it still left me feeling the 'good' guys all deserved to be locked up at the end for the safety of everyone else. Only the sheer momentum of the writing carries you past the fact that their response to have having an armed hoard of terrorists on the loose is not to call in the authorities but to try to kill them themselves. This, then, was a book with lots of promise in what should have been its main theme, that became hijacked to become a very lengthy action thriller. Disappointed.